Devin Kravitz, born January 31, 1984, grew up in Leicester, Massachusetts. A very active kid, he played Little League, soccer, and Pop Warner football. He was a member of the Greenville Baptist Youth Group and loved going on retreats with the church. Devin had the need for speed. His greatest recreation love was dirt bikes. 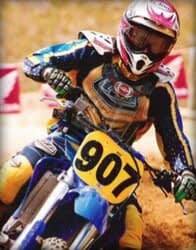 In 1999, he started racing with the New England Sports Committee and became an expert rider in his third year of competition, not an easy accomplishment. His professional race number, 907, was retired in his honor. Devin graduated from Leicester High School in 2002 and went on to Quinsigamond Community College part time taking courses in criminal justice. He also spent time on the Leicester Volunteer Fire Department. Devin worked in the carpentry and electrical fields with local companies and spent a lot of his time helping family and friends with their home improvement projects. In September 2006, he was selected for the Police Academy and would have started in December 2006. On October 25, 2006, Devin passed away in his sleep from cardiac arrest due to Myocarditis of viral origin. He was 22 years old. Heart disease comes in many forms and it does affect the young and old alike. Often time’s simple tests can prevent death, especially in young people. Devin leaves behind his mother Janet, his father Stuart, his sister Elizabeth, his fiancée Danielle, and who he would have enjoyed tremendously, his baby boy Austin, born on May 30, 2007. Since his death, his family and friends, along with the community come together for the Devin Kravitz Memorial 5K Road Race, DK5K.org. The event is always held Labor Day weekend in his home town, to raise awareness of myocarditis and to raise money for research. All proceeds from the event are donated to The American Heart Association and The Myocarditis Foundation.